Tony Blauer discusses Personal Defense Readiness with Coach Divine – Video. I was reflecting today on how SEALFIT, as a trainer of Special Operations candidates, has also become a trainer of a new breed of civilian sheepdog. More and more 30 to 50 year-old, modern-day professional warriors are coming through our training seeking answers to how the martial warriors, such as the modern Spartans and Navy SEALs, think and act. I know that my military readers will have read or heard of Dr. Grossman’s work, “On Killing.” This is a must read for warriors. Since I can’t assume our professional warriors know of this great work, I thought I would share it with the community in this email. The Dr. describes a world largely populated with sheep (presumably grazing on consumerism and a diet of junk food and junk information!) Preying on these sheep is a small percentage of the population who are wolves, drawn to violence without conscience. The wolves pick away at the weakest sheep, and society pays scant attention. When you are the sheep who enters into the cross-hairs of a wolf, your world will change from ignorant bliss to terror in the time it takes you to read these words. Should you survive, you will be changed forever. In those moments, the sheep scream out for help. Who hears them? It is you, the sheepdog. The sheepdog is typically the law enforcement officer, first responder or soldier. These servants have taken a vow to protect the sheep. Increasingly it is also the warrior professional who steps up and takes a stand. You must be that person, the sheepdog, if you are living the warrior’s path. Interestingly, when all is quiet the sheep want little to do with the sheepdogs. Out of sight, out of mind. The sheepdog makes the sheep nervous because they sense that the sheepdog is also prone to violence and has dangerous skills. My neighbor Steve is convinced that I am off in foreign lands rolling up the bad guys if he doesn’t see me for a couple days. He loves having me as a neighbor, but doesn’t know how to have a normal conversation with me. He is nervous I will decide I don’t like him in mid-conversation and take his head off. Funny guy. Sheepdogs, though trained for violence, are really nice people! Anyhow, back to the story. The sheepdog’s violence is very different from the wolf’s violence. The sheepdog is bound by a contract or code of conduct to serve, balanced with a set of values that are life-supporting and socially acceptable. Further, he or she is trained to control the application of violence like a faucet meters water. This control takes many hours of training to hone and is essential to the warrior’s honor. How do you train to harness the power of violence in a controlled manner? It takes a lot of effort to do with mastery – at least 10,000 hours of effort. We seek to get warrior professionals on the path to mastery of this “offensive mind” through our Combat Defense seminar. We teach that the psyche has a “binary switch” of violence which you can learn to turn on and off at will. The “bamboo party” of my Ninjutsu training was about this same principle. Four black belts would place large bamboo poles over the ankles, hips, chest and finally throat of the brown belt. Within seconds all lights are out, and about a nano-second later the student has broken free, shattered the bamboo, sent the black belts rolling and is standing on his feet with no idea whatsoever how he got there! That is offensive mind training. Last week I mentioned that we are hosting a Blauer Tactical Personal Defense Readiness Certification at SEALFIT November 4th to 6th. Tony Blauer is a sheepdog whose training program also develops the offensive mind set and binary switch. I sat down and spoke with Tony about the PDR and SPEAR programs and learned some interesting things. Visit www.pdrteam.com to enroll in the PDR cert. Tell them you found out about it from me and Tony may give you a discount (at least he hinted to me that he would!). SEALFIT training for 2011 is coming to an end. There is still room in our One Week Academy and Kokoro Camp starting next week. We also have our last Three Week Academy of 2011 is this October. The next one isn’t scheduled until June of 2012. The October Kokoro will be a big one and the final event of 2011 is the SEALFIT Warrior Athlete certification scheduled for November 7th thru the 11th. 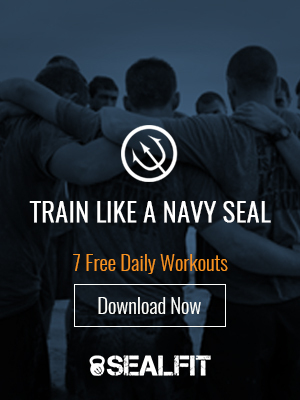 This is the ONLY SEALFIT certification program we offer. We changed the name from “Physical Trainer” certification to reflect our unique value to the trainee. Final note: my “8 Weeks to SEAFLIT” advanced training guide is now available online, and we now have available our new SEALFIT WOD shorts from 2Pood. To say these are sweet is an understatement!